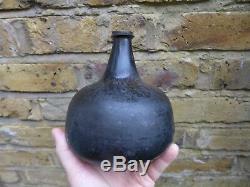 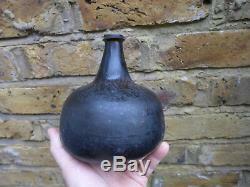 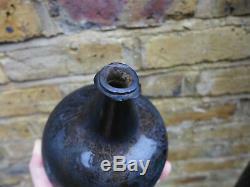 English Black Glass Onion Shaped Wine Bottle Circa Early 1700s. 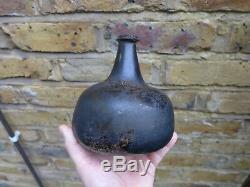 6 inches in height and just under 6 inches in diameter. 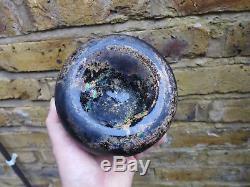 This bottle is over 300 years old and has been found in the sea, the surface of the glass has taken on a attractive matt patina from water and sand wear, there is some colourful iridescence to the base. 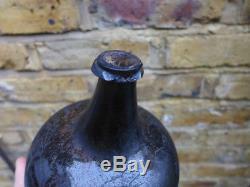 The bottle is fully intact with no cracks, damages or repairs, slight chipping to the string rim and minor surface scratches. 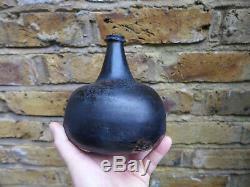 The item "English Black Glass Onion Shaped Wine Bottle Circa Early 1700s" is in sale since Friday, January 18, 2019. 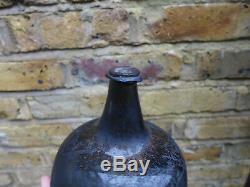 This item is in the category "Collectables\Collectable Bottles & Pots\Wine & Black Glass Bottles". 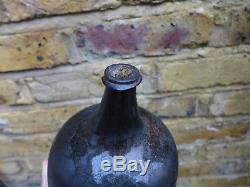 The seller is "early-art" and is located in london.